Look what treat came in the mail last week! 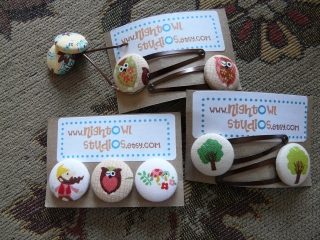 Lisa from Night Owl Studios at Etsy makes these darling hair holders using Japanese fabric and more. Two aren't pictured as I am wearing them in my hair now. Oops. Lisa has 5 kids and manages to bust these out in the wee hours (thus Night Owl Studios). Can you imagine? She is on of the nicest sellers I've ever encountered and whipped these out super-quick. They are made very well. They are so cute! I can see why you had to have some. Dear Sarah! You are so kind! Thank you for the wonderful compliments...It has truly been a joy working with you. :D Please come back anytime! I do hope your neice has a lovely birthday...Take care, my Etsy friend!